Water dripped from the ceiling. A broken speaker cleverly tied to a pole fashioned with a belt and a guitar strap beamed the voices. “We are really DIY, like, we won’t even buy a real strap to hold that. That’s something you don’t get at a venue,” host and musician Bobby Comparda, 26, half-jokes. 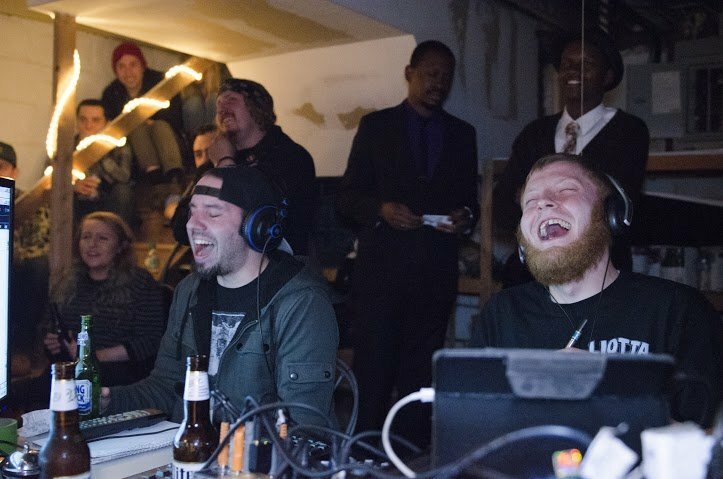 Hosts Paul Wolfe (left) and Sean Ast (right) laugh so hard at the comediens at the March 21 Lousy Weather Media Basement Comedy Show Three, Ast smacks the table. The LWM comedy show started in October 2014. “Eh! It’s the Lousy Weather Media Basement Comedy Show! Eh!” rattles host, Sean Ast, 26, of Goodyear Heights. It’s his basement. It’s also Comparda’s basement. The buzzed crowd woo’d loudly and clapped. Eleven white plastic chairs filled three rows deep behind a small black futon. Another black futon squared off a makeshift stage. Two dining room chairs, two PA speakers laid down as benches and a lawn chair were placed to let you know the hosts had thought of everything you could possibly sit on. Backs lined the wall up the stairs. There was even a guy sitting on an exercise machine. On nights dedicated to the comedy shows, the hosts bring in their favorite local comedians and musicians, picking new acts they explore between shows. Host Paul Wolfe, 27, of Akron, proactively goes to local comedy shows and reaches out to comedians and musicians he wants onboard. The idea of having basement comedy shows spun off of Ast and Wolfe’s experiences of being in bands and playing in basements. It’s to “bring the comedy world to punk rock,” said Ast. “I think shows in a basement are the funnest thing in the entire world,” adds Comparda. Two boxes stacked on a dryer cradled a black HP laptop with a video-streaming camera attached so people could follow via social media sites. To thank those who came, pay the comedians, and offset the cost of their podcast dues, the trio set up a raffle. “The whole reason why we do this is because we host a podcast and we have all these people on it and we want to showcase their talents,” Wolfe said. “We celebrate everything about this city,” Ast said. To catch the next show, ‘Like’ Lousy Weather Media Podcast Channel on Facebook. Comedy helps to survive, without it in any way.